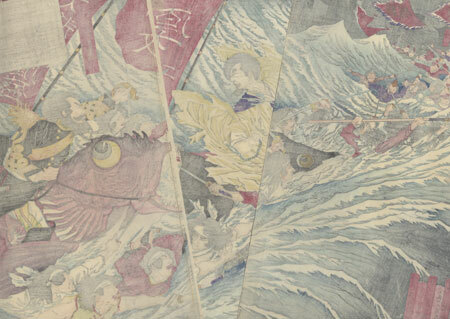 Comments - Dramatic depiction of Saigo Takamori, the leader of the rebel samurai during the Satsuma Rebellion, riding an enormous red snapper as he leads samurai troops through a sea of crashing waves to attack the palace of the Dragon King under the sea. Wearing a black military uniform with braided trim, he thrusts his sword forward, his fringed epaulet and tasseled red cords fluttering in the wind. 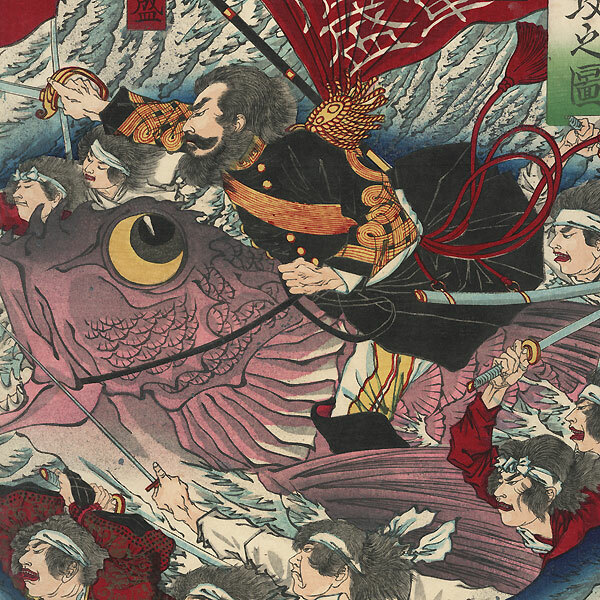 At center, a Buddhist priest rides his own fish, clutching a string of prayer beads and pointing with his finger. Enemies rush to meet them from the left, flying red pennants trimmed with purple fringe. If you look closely, you can make out fish and an octopus atop the heads of the Dragon King's retainers. The walls of a castle can be seen in the distance under the gray night sky. A fantastic, imaginative design with terrific detail in the expressive figures and white-capped waves. Includes burnishing on the black uniform, and a fine spattering of white pigment on the center panel and black pigment on the right panel to indicate the spray of the water. A great design, rarely seen. A fantastic subject for a Yoshitoshi collector. Condition - This print with excellent color and detail as shown. Three separate panels. Slight separation at ends of vertical fold at edge of each panel, a few wormholes, repaired. Slight soiling, a few creases at edges, faint stain. Please see photos for details. Good overall.